12/18 Months - $48.99 3T/4T - $48.99 Only 6 left! Does your baby have a wonderful fascination with dinosaurs? Is his favorite toy a stuffed dino that he never let's leave his side? Do his imitations of dinosaurs’ roars warm your heart more than a hot cup of coffee in the morning? Well, then get ready to give your little bundle of joy a prehistoric experience! This adorable Blue and Orange Dino Costume will give you the cutest ankle bitter in town. Your baby boy will be transformed into a lovable triceratops once you bundle him up in this cozy jumpsuit. Besides your kiddo’s ear-to-ear smile the cutest thing about this costume is the delightful soft-sculpted dinosaur face with horns on the hood. What really brings this endearing outfit together is the tiny blue attachable tail. Dress your infant up with this costume and he’ll be ready to collect more candy than any other baby in town. Of course, if Halloween is still a ways off, you can still get in an awesome prehistoric photo shoot! Set up the scene and let your tri-horn stomp around. You’ll be sure to capture the cutest pictures of a dinosaur anyone has ever seen. Got more than one kiddie to dress up or even a pup running around? 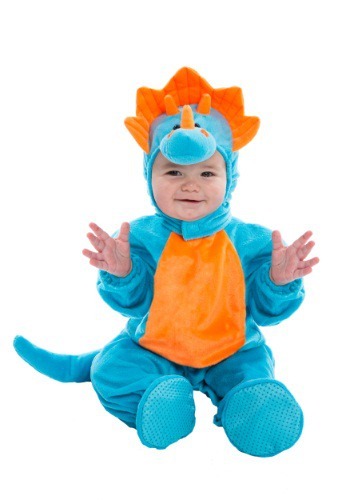 Well then take a look at the rest of the dinosaur costumes we have for children and pets. Your home could become the next Jurassic Park. Only more of like a petting zoo version of the famed amusement park because all of your dinos will look extra huggable!